Forbes is one of the most influential publications when it comes to reaching business leaders. The publication also employs some of the smartest journalists in the biz, making it that much harder to secure placements. Today, MACIAS PR secured a thought leadership placement with Forbes. Read the editorial, Thinking of Starting a Business in 2018? Here’s your Introduction to Alternative Lending, by clicking here. This was the fifth media placement MACIAS PR secured with Forbes in 2017. Hopefully that track records provides a little more proof on why there is substance behind this advice. Here’s some insight on how MACIAS PR secured that story with Forbes. Can you sell a story in 30 Seconds? Very few publicists get to go inside the morning news meeting where stories are debated, argued, sold and bought. Before I launched this PR firm in 2009, I lived inside those morning news meetings at both the local and national level. I pitched stories inside the Arizona Republic and the local TV station, Channel 3. In New York, I pitched stories for a nationally syndicated TV program, American Journal. I also approved story ideas as the Executive Producer for Special Projects with NBC. I don’t want to bore you with my journalism background. (You can read more of my background on LinkedIn). Here’s why that experience inside the newsroom matters: you only have seconds to pitch a story and that background is the center-point of MACIAS PR. As the above video demonstrates, if you can’t identify the narrative, communicate the story and angle within 30 seconds, your PR firms in tech and healthcare won’t succeed. Business owners, politicians and entrepreneurs can all learn a lot about handling a crisis by watching how the Trump administration continues to handle – or mishandle – the Russia collusion investigation. I’ve run many crisis campaigns for clients in the financial, nonprofit and political sector. A political campaign in itself is always in crisis mode as candidates continue to dig up dirt on the competition. Likewise, the crisis campaigns I ran in the nonprofit and financial space were more centered around protecting their well established brands. The first thing I always tell clients in any crisis situation: Never lie. Don’t lie to reporters. Lying is not a crisis strategy. I wrote about this in my business book, Beat the Press: Your Guide to Managing the Media. The second half of my book is devoted to handling negative news. Chapter 6 provides 10 Defensive Decrees that you can apply to any crisis situation. The best PR firms evolve quickly with the times. I say that not only as the owner of this PR firm but also based on my time as a Reporter, Producer, Senior Producer and Executive Producer in the media. Today’s media placement requires more precision and a more strategic approach than it did just 10 years ago. A PR firm needs to understand how a reporter and journalist thinks in the different industries. For example, you must approach a TV producer differently than a TV reporter, just as you need to refine a pitch for an online reporter in a more concise and direct way than you would for a print reporter. The above video gives you visual on how the media landscape has changed. Here’s how to make sure your publicist is responding correctly in this new era. PR vs. Billboard Advertising – Which is Better? MACIAS PR recently received this mailer at work. We couldn’t help but wonder – are business owners actually paying for this kind of marketing? People move fast on the streets of New York City and rarely pay attention to signs, let alone moving billboards that could run them over. 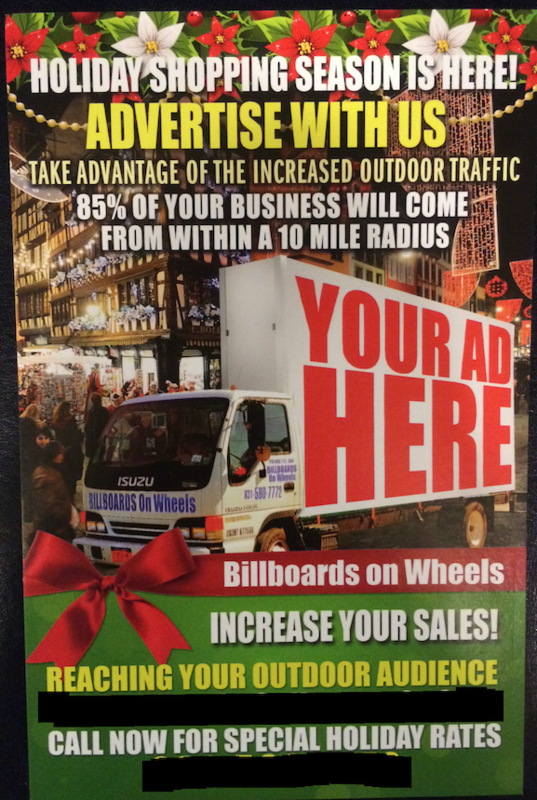 Mobile billboard advertising is also not targeted. It drives randomly down streets, giving random odds of reaching your targeted customer. So how does this compare to PR?